The rapid evolution of communications market raises a lot more awareness of the users to the service quality. To most big cities, enhancing customer services seems to be more and more important.The problems of how to convenient the customers and increase the image to the outside world of the communications between the companies and the customers, are well solved by the Kiosks industry’s rapid growth. One of our customers from Beijing who is a Checkoo self-service terminal operator, benefitted from experiencing the products and is achieving great developing and creating the “one-station Internet landing platform.”This kind of self-service terminal is now extensively placed in public places where there is great pedestrian volume. For example, hospitals, schools, malls, supermarkets and offices, etc.Xiamen Four-Faith Communication Technology Co. Ltd. gained reputation in the industry by its solid ability to create and investigate. Which became the provider of the Beijing self-service terminal operator, Four-Faith has supplied the operator with 350 4G wireless router, and helped which with the establishment of its project in Beijing. Four-Faith Checkoo from the consumers through self-service terminals, self-service library terminal program by money, the Four-Faith F3X34 4G Industrial router and back-end management platform consists of three parts. It is also used to establish a wireless network system implementation of marketing, advertising, consumer information, consumer self-service router F3X34 3G/4G and other business data exchange services. Four-Faith F3X34 series of products is made of sturdy and durable technical exterior designs. IP30 protection is available in -30~+75ºC extend temperature applications. 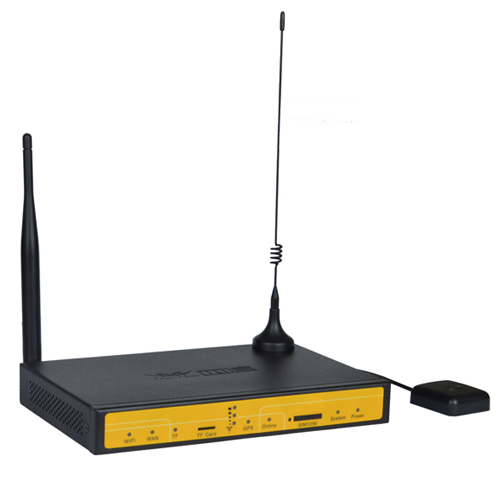 Moreover, it works in harsh industrial environments.Built-in high-performance 32-bit industrial-grade and industrial-grade wireless communication processor module, embedded real-time operating system and software support platform, at the same time provide a RS232 or RS485 / RS422, four Ethernet LAN, an Ethernet and a WIFI wan interface, can connect a serial port equipment, Ethernet and WIFI equipment, implement the data transparent transmission and routing functions.The outstanding property and various connectors creates a wireless advantage for business applications, which easily achieve the goal of conveying timely information. Outdoor self-service equipment, based off the service of the information of the locations, not only accurately reaches the goal of marketing promotion, but also brings the business more customers.Four-Faith is very experienced in the self-service terminal communication industry. It tries its best to make progress on the property of the products. The system made up with Four-Faith F3X34 4G router costs a little, nevertheless achieved safety data from the buffet line equipment business, flexible and efficient interactive, self-service technology to improve the level of customer self-service business can be developed to provide a strong support network communications.